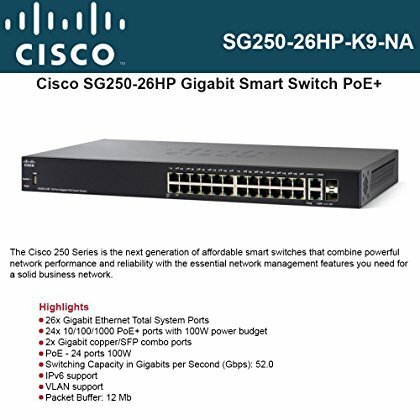 Cisco SG250-26HP 26-Port Gigabit PoE Smart Switch. With Cisco 250 Series Smart Switches, you can achieve business-class network performance and security without paying for advanced network management features that you will not use. When you need a reliable solution to share online resources and connect computers, phones, and wireless access points, but low cost is a top priority, Cisco 250 Series Smart Switches provide the ideal solution. The Cisco 250 Series is the next generation of affordable smart switches that combine powerful network performance and reliability with the essential network management features you need for a solid business network. These expandable Fast Ethernet or Gigabit Ethernet switches provide basic management, security, and quality-of-service (QoS) features beyond those of an unmanaged or consumer-grade switch, at a lower cost than managed switches. And with an easy-to-use web user interface, Auto Smartports, and flexible Power over Ethernet (PoE) Plus capability, you can deploy and configure a complete business network in minutes. With Cisco 250 Series Smart Switches you can achieve business-class network performance and security without paying for advanced network management features that you will not use. Cisco 250 Series switches work with Cisco and third-party wireless solutions to extend the reach of your network. Power over Ethernet Plus (PoE+): Cisco 250 Series switches are available with PoE+ on both Fast Ethernet and Gigabit Ethernet models.